A good fiber optic installer knows exactly what he has to do, there’s no doubt in that. But we bet a short reminder of the basic techniques that guarantee quality and efficiency is always welcomed. 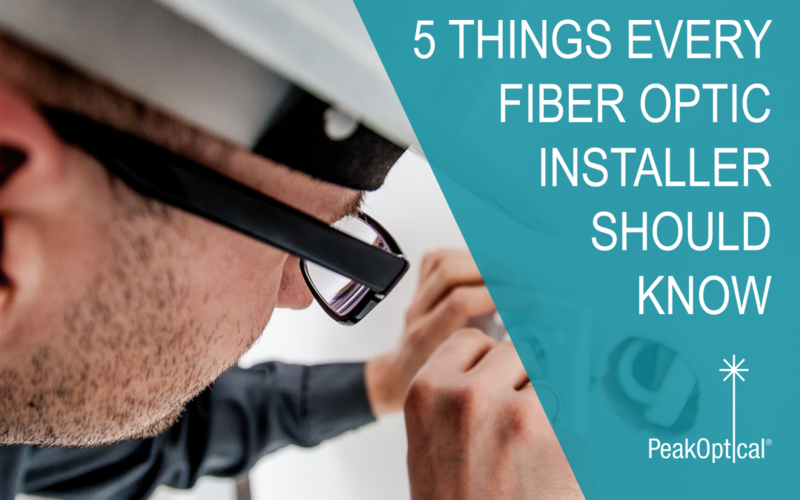 We have gathered together in this article five of the most important things every fiber optic installer should be aware of. It is essential to put a great accent on the quality of the products you are working with. Make sure you use high-qualitative products that protect the fiber strands. You also must take notice of all the factors that could alter the condition of the products you are using, especially if the cabling is installed outside. You can take a look at PeakOptical’s fiber optic components. Avoid to put your eyes in direct contact with the laser light. While, depending on the laser’s power, some lights can be harmful for the human eye. Remember never to look directly into the end of the cable, as the wavelength of the lasers is in the infrared band. Did you know that a speck of glass can actually have the same size as a fiber cable core? Always keeping dust covers on connectors and cleaning them carefully only with pure isopropyl alcohol on a lint free pad will prevent the component’s surfaces getting scratched and damaged. Compatibility in fiber optic components is indispensable for a fully functional infrastructure. Make sure you are using the right connectors. You can read more about how to choose the right fiber connector for your network here. Make sure your device is fully compatible with the type of fiber optic cable you are working with, being it single mode or multimode. Single mode cables are designed to carry light directly down the fiber. It is a single strand of glass fiber and has a diameter of 8.5-10 microns. Because it has one mode of transmission, it will propagate 1310 or 1550 nm. Compared to the multimode fiber, the single mode patch cords carry a higher bandwidth, but it requires a light source with a narrow spectral width. The single mode gives a higher transmission and up to 50 times more distance than the multimode. The core from a single mode cable is smaller than one from a multimode. Single mode is a vital part of broadband networks. It designed to transmit data over long distances, thus making it perfect for cable television networks or college campuses. Multimode patch cords have a bigger diameter, typically 50-100 microns for the light carry component. Over medium distances, multimode fibers give high bandwidths at high speeds. Light waves are dispersed into numerous paths, or modes, as they travel through the cable’s core typically 850 or 1300nm. In cable runs longer than 914,4 meters, the multiple cable pats can cause distortion at the receiving end, resulting in an unclear and partial data transmission. Multimode cables are considered to be the “domestic” fiber as they are used for local-area network, as an example, they can be used in FTTH. Multimode can reach up to 100Gbps Ethernet. After you finished installing everything, don’t forget t test if everything is working as expected. You need to check if the fibers are correctly connected together and that the pathway is complete.